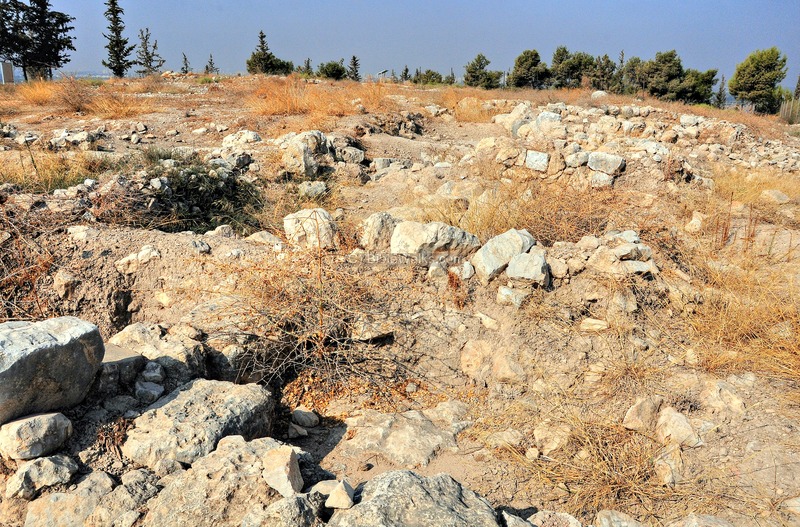 Ruins of a small Iron age settlement on the hills facing Afek, identified as Eben Ezer. 1 Samuel 4 1: "Now Israel went out against the Philistines to battle, and pitched beside Ebenezer: and the Philistines pitched in Aphek". An Iron age agriculture settlement was excavated in Izbet Zartta, a small hill on the western hills of Samaria close to the ancient city of Aphek (Antipatris). 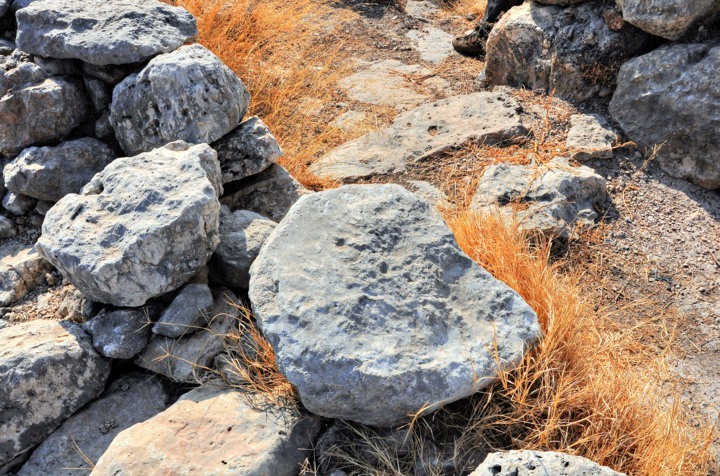 It is identified as Ebenezer ("Stone of Help"), the place where the Israelites camped during their fatal battle with the Philistines. 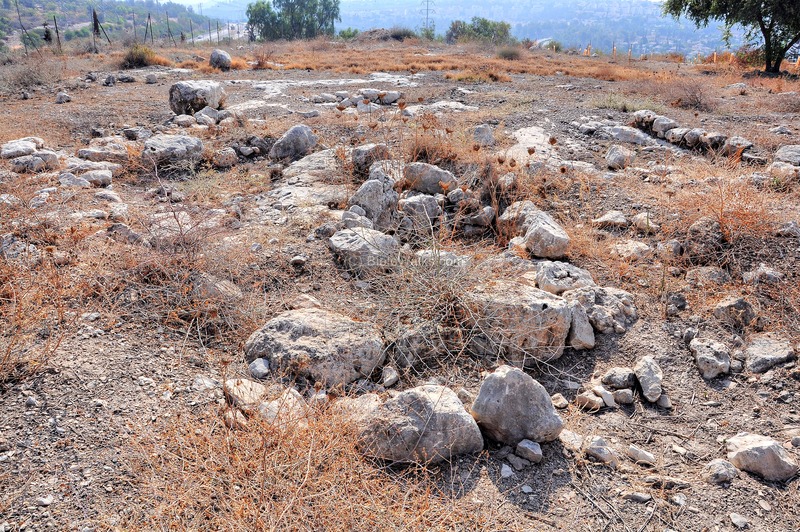 The site of Izbet Zartta is located on the side of the highway from to Samaria, between the north houses of Rosh-Ha'ayin and the industrial zone of Kfar Kassem/Rosh-Ha'ayin on the north. 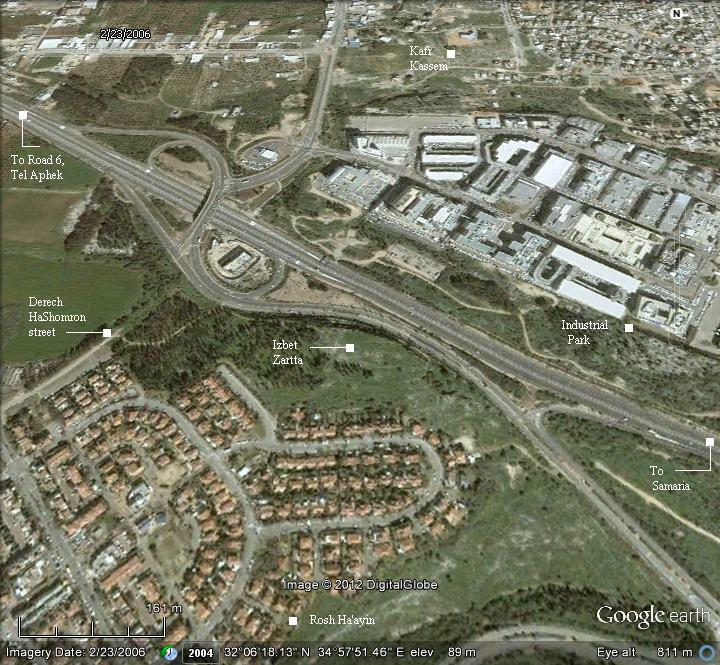 To access the site drive and park at the end of Derech Hashomron ("way of Samaria") street in Rosh Ha'ayin. 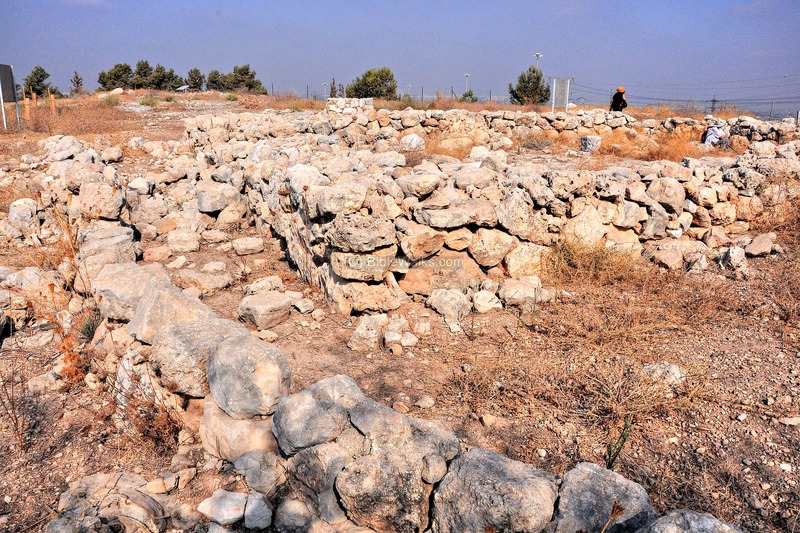 Izbet Zartta is located 3km east of the ancient city of Aphek, one of the important cities during the Biblical period. 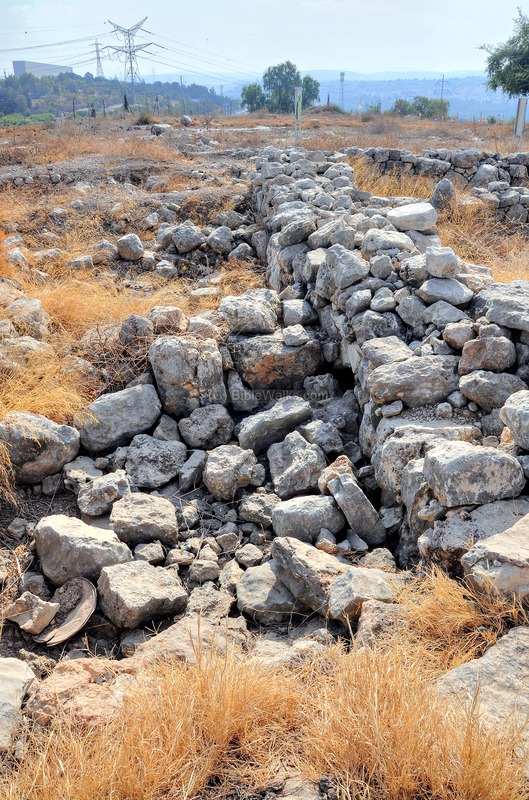 Aphek (Afek) is strategically located on a pass along the north-south Via Maris, the ancient road that connected the regions north of Israel (Mesopotamia, Asia minor and Syria) to the south (Egypt). This narrow pass of 2KM was an ideal location for the ancient city, since the trade caravans had to pass at this site. The passage was blocked on both sides of the city: eastwards to the sea was the Yarkon river and its marsh lands, and westwards are the hills of Samaria. More than 6,000 years of successive cities have been built on the mound overlooking the springs of the Yarkon river. There were 5 Israelite settlements on the western hills near Aphek. These sites probably supplied agriculture goods to the central city. 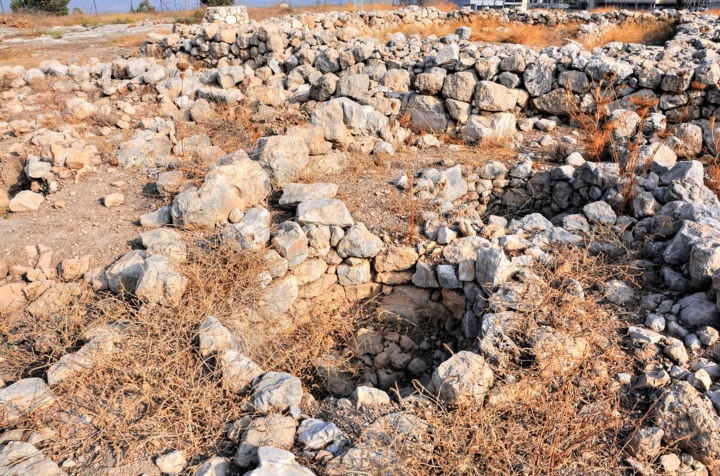 These Iron age sites were part of the large settlement wave in the hills of Samaria during the 11th-12th C. One of them is Ebenezer, which is identified at the ruins of Izbet Zartta. 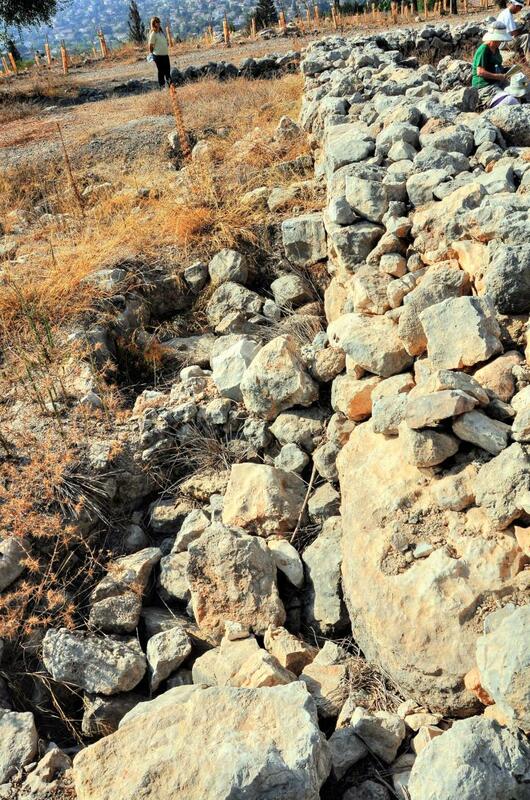 Ebenezer is situated 5KM south of the ancient road from the coastal plains to the high mountains of Samaria. 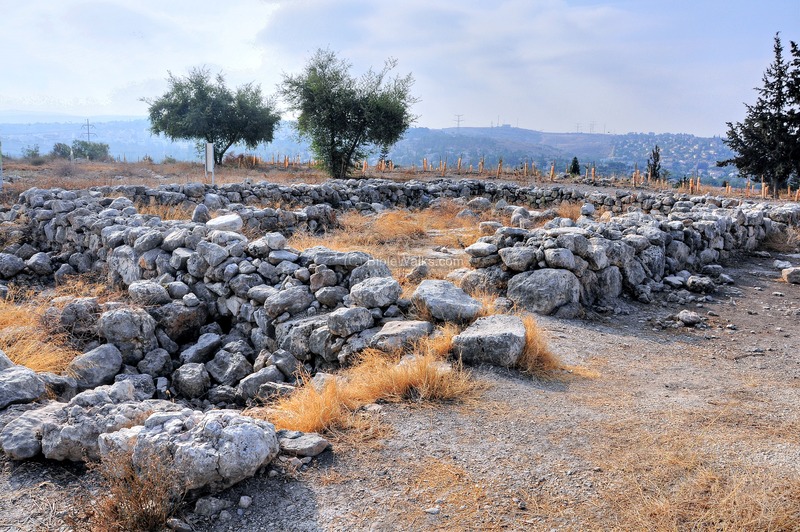 During the times of the Judges, Samaria was the center of the Israelite area, and the Ark of Covenant was located in Shiloh. The ancient road from Aphek to Samaria is marked as a dashed line on the map as "Kanah brook", leading up thru Tappuah to Shiloh and Shechem. The Philistines - "Sea Peoples" from the Aegean sea - landed in Canaan and Egypt in the 12th C BC. The Egyptians fought the invaders (Ramses III battle of 1175BC) and repulsed them into a small enclave in the southern coastal cities of Canaan (from Gaza to Ashkelon), as per (Joshua 13, 3): "...five lords of the Philistines; the Gazathites, and the Ashdothites, the Eshkalonites, the Gittites, and the Ekronites". At a later stage the Philistines moved northwards until the Yarkon river north of Jaffa. They replaced the Egyptians, ruling the area until King Solomon's times (1000BC). The Philistines became the arch enemies of the Israelites until the 8th C BC. During the 12th C and 11th C, Aphek was part of the Philistine territory. Their control of the plains were initially not a threat to the Israelites who dwelled in the hills of Samaria. However, towards the beginning of the 11th C BC the Israelites pushed westwards towards the plains. Their settlements along the western edge of the hills, including Ebenezer, were part of this push westwards. The pressure built up in the 11th C, which eventually brought them to clash. The site of Ebenezer and the other Iron age farms near Aphek were probably deserted even before the battle, as exposed in the level III and according to the analysis of the excavator of the site, Israel Finkelstein (debate, p36). 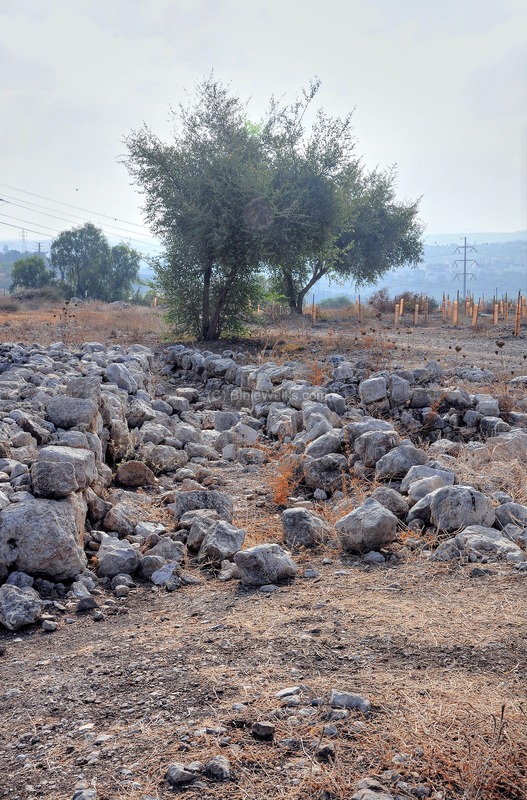 The site was rebuilt (level II) only at the end of the 11th C, probably after king Saul's victory over the Philistines and their retreat from the hills of Samaria and Judea (1 Samuel 14 31): "And they smote the Philistines that day from Michmash to Aijalon". However, the Philistines pushed back again towards the hills, defeated Saul on Mt Gilboa (1 Samuel 29 1, 31 1): "Now the Philistines gathered together all their armies to Aphek....Now the Philistines fought against Israel: and the men of Israel fled from before the Philistines, and fell down slain in mount Gilboa.". And so Ebenezer was probably deserted yet again (end of level II). They returned only at the middle of the 10th C (level I), after David defeated them twice in the hills (2 Samuel 5 25): "And David did so, as the LORD had commanded him; and smote the Philistines from Geba until thou come to Gazer". The return to the site was only for 10-20 years. This time the site was abandoned not because of the Philistines, who were pushed back south. Rather, the Israelites moved down into the fertile plains. After the middle of the 10th C BC, the site remained deserted. 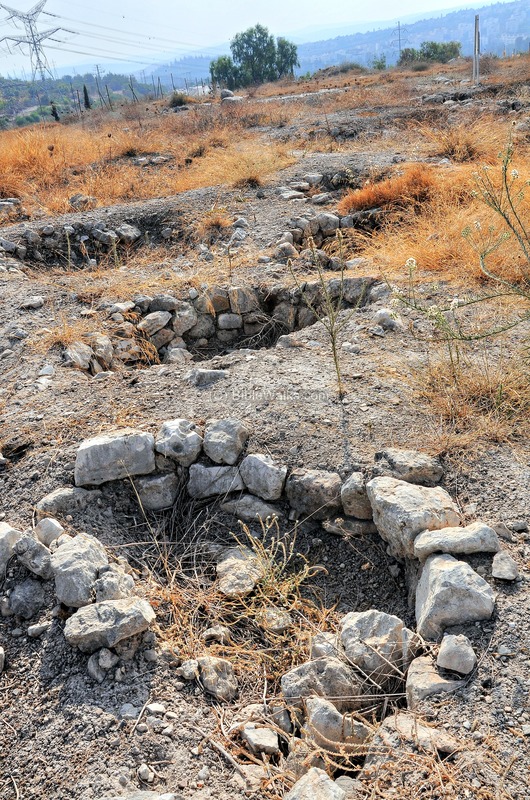 Few remains were found on the surface dated to the Byzantine period, indicating that the site was used for agriculture activities. During the British mandate, the western foothills were used for a quarry. 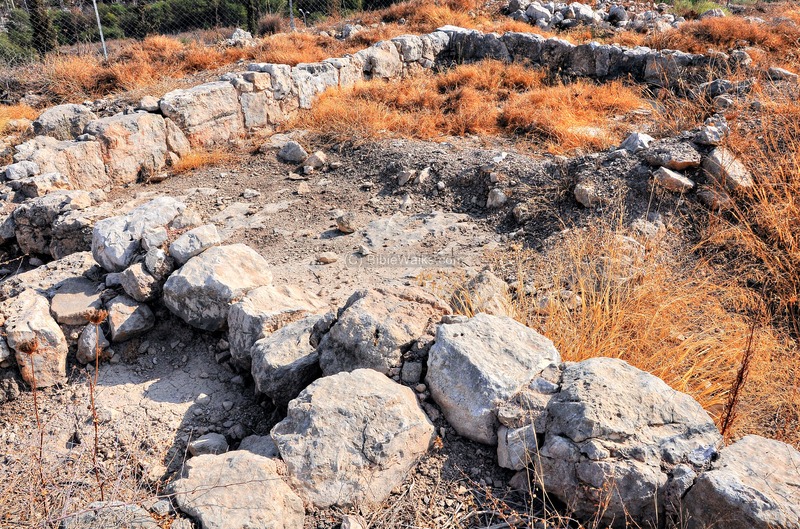 The site was discovered during the survey by Tel-Aviv University in 1972. excavations were held during 1976-1978, headed by Moshe Kochavi and Israel Finkelstein. The site can be freely visited, as it is part of a park on the side of Rosh Ha'Ayin. 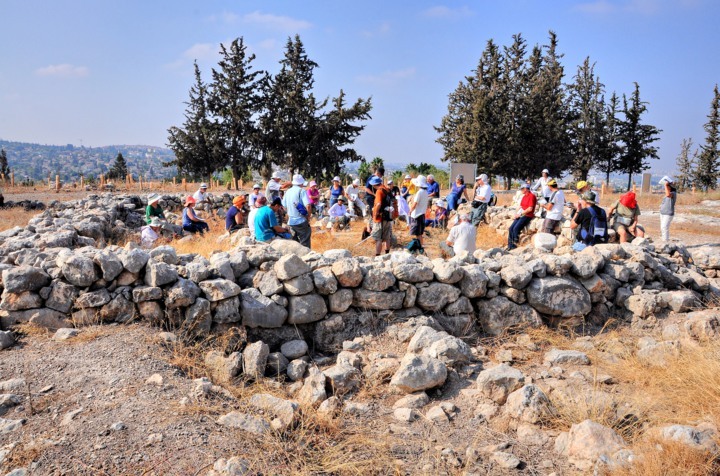 Although it is not an impressive archaeological site, you can pull out the Bible and see where the events actually took place. The excavations revealed that there were 3 phases of constructions at this site over a period of about 250 years. The site started as a oval courtyard, probably for the purpose of enclosure for livestock. The courtyard was replaced during the second and third phases of the site by a large 4-room type house, surrounded by a large number of grain silos. This transition from livestock to raising crops is typical of the Israelite shift from nomads (raising sheep and goats) to farming (raising crops). 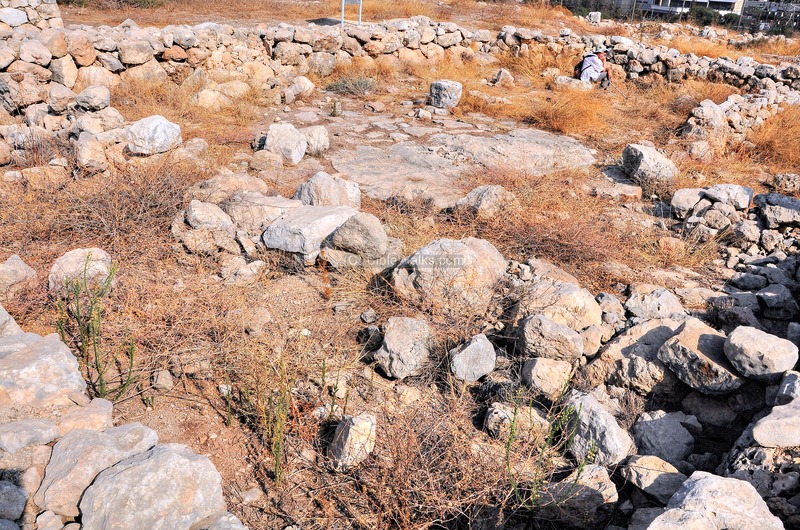 Izbet Zartta is located on a small hill which is accessible from the northern houses of Rosh Ha'ayin ("The head of the Spring", seen in the background). This quad copter view shows the site from the west side, with traces of the ruins visible in the center of the hill. The quarry on the bottom right side cut into a section of the hill. The group, seen here in the center of the 4-room house, came to study the history of the site and the story of the battle between the Israelites and the Philistines, when the Ark of Covenant was lost. In the second level of the site, a dozen or more houses were built. Their design is called "4-room" house, which is a typical form of Israelite dwelling during the Iron Age. The "4-room house" design was a compact house with thick external walls and a single entrance, designed for protection. It supported a roof, or even a second level where additional residential rooms were located. The "4-room" house was a dwelling place for the family, kitchen, storerooms and also a place for the cattle (ox and mules). The standard type was a rectangular design covering a total area of 150-200 square meters. The design was based on a long house with four main spaces - a broad room in the back and three long spaces extending forward from it. The rooms were divided by stone pillars and walls.. The central room was a courtyard, which was normally open to let in light since there were no windows in the house. A large house was constructed in the center of the site during the second phase (level II) and was rebuilt during the third phase. This picture shows the north-west corner of the house (named house "109"), where its entrance is located. The following photo is a view from the south-east corner of house "109". There were 2 rooms on the bottom of this picture (which is the south side of the house). These rooms opened to a large courtyard (in the center of this photo), where 6 columns supported the second level or roof (two are seen standing there, while the other columns were removed). The next picture shows the entrance to the house, as seen from the inside. It is located on the corner rather than on the northern wall, which is the common design. The entrance led here to the courtyard. The southern side of the house is seen below. Its thick wall is on the left side, while on the right side is a small wall and grain silos. The north side of the house is shown in the next picture. The thick wall is on the right side, and adjacent to it are 3 external storerooms. The closer storeroom was part of the level II construction, while the other two rooms were added in the third phase. The eastern side of the 4-house structure is seen next. A number of grain silos were located near to the wall. One of the remarkable findings in the site was a large number of granaries - grain silos. These small pits are scattered all over the site, and are dated to the middle of the 10th C BC. Inside the silos were remains of charcoaled grain, an evidence of a fire which destroyed the site. The silos are 1m deep, dug into the soil or into the rock. The sides of the silos are lined with small stones. The stones protected the grain from the rodents. The large number of granaries could have stored tons of grain, which was a product of vast areas of fields, which can be found only in the plains. Adam Zertal wonders ("Nation is born", p. 325) if the site was actually a central repository of grain for Aphek, paid as taxes from a larger region. An Ostracon is a piece of pottery or stone with letters scratched on it. It is a Greek word ("shell") which was based on the use of pottery shards for voting ballot, with the name of the person written on it. During the excavations (1976), a piece of ceramic was found in one of the grain silos (#605). It was engraved with 103 "Proto-Canaanite" (early Hebrew) letters, mostly written left to right and arranged in five lines. The first four lines with 81 letters are hard to decipher. The fifth line contains an alphabet (termed "abecedary") with 22 letters, which are with larger and deeper strokes. The Ostracon is dated to around the time of the battle of Aphek - at the second quarter of the 11th C. This is one of the earliest inscriptions in Hebrew found to date. The Alphabet line and some of the other lines have mistakes, like letters written in reverse. The letters are hard to decipher since they are scribed in old Hebrew letters and their fonts could be interpreted in various ways. The grammar is also difficult, as the text is missing vowels, articles and conjunctions. These limitations cast some doubts in the accuracy of the translation. 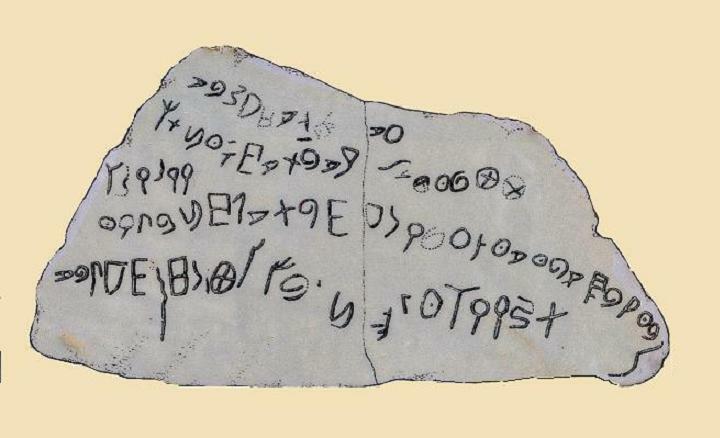 The Ostracon may have been the result of an exercise of a student practicing writing. Brian Colless interpreted the four lines as "a student is earning to write the alphabet and muses over the art of writing on tablets". Other scholars suggested various analysis and interpretations (Kochavi (1977), Demsky (1977), Naveh (1978), Cross (1980), Dotan (1980), Puech (1986), Sass (1988) and more). According to the amazing analysis suggested by William Shea (1990), the first four lines describe the event of the loss of the ark of Covenant to the Philistines, its journey and return - as told on 1 Samuel 4-6. The first line tells of the advance of a group of people (probably Israelites) from Shiloh to a field at Aphek. The second line identifies another group, the Kittim (Philistines), who took an object (the ark?) to a series of three sites (Azor, Ashdod and Gath). The third line identifies another place where the object was returned to (Kiryat Jearim) . The forth line describes the course of the battle, when the priest Hophni returns to report on the lost of the Ark and his brother (Phinehas). 1. Unto the field we came /, (unto) Aphek from Shiloh. 2. 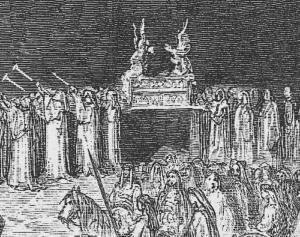 The Kittim took (it and) came to Azor, / (to) Dagon lord of Ashdod, (and to) Gath. 3. (It returned to) Kiriath- Jearim. 4. The companion of the footsoldiers, Hophni, came to tel/l the elders, "a horse has come (and) upon (it was my) brother for us to bury." Shea summarizes the inscription as "According to its lexicography, morphology, and syntax, it was written in good classical Biblical Hebrew". If this is a true interpretation (although this analysis was ridiculed by many scholars) then this fragment backs up the Biblical accounts of the loss of the Ark. During the first phase of construction the place was protected by a wall. Along the inner side of the wall were rooms, forming a typical design called "casemate" - double walls with dividing walls between them. There was a single entrance to each of these chambers or rooms. In this picture the wall is seen behind one of the rooms. There were a total of about 25 such rooms along the entire length of the wall. Other structures and grain silos are located on the east side. The structures were constructed at the second phase o the site. Beyond it are traces of the first phase wall. Eben - from Hebrew: Even is "stone"
Eben Ezer (Even Ha'Ezer) - Hebrew: "stone of help". Perhaps, the stone refers to the stones of Moses in the Ark, which was brought to help the Israelites during the battle. Another source of the name: Ezer was sons of Ephraim, killed by the Philistines (1 Chronicles 7 20-22). A Biblical source suggested by A. Khamashata (1 Samuel 7:12): "Then Samuel took a stone and set it up between Mizpah and Shen. He named it Ebenezer, saying, “Thus far the Lord has helped us.”"